Many students complain that they are not “math people” and therefore struggle on standardized math tests. Join Megan as she breaks down three reasons why students tend to struggle needlessly, and five strategies for improving their scores. 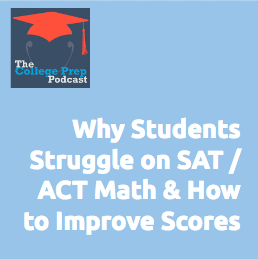 If you’d like some specific advice from Megan related to applying these concepts in your ACT / SAT review, please email us at collegepreppodcast [at] gmail [dot] com.